When you visit a doctor, dentist or another medical professional for care and treatment, you are putting a considerable amount of trust in that individual or practice. You trust the medical professional will make an accurate diagnosis, prescribe the correct medicine and perform the proper treatment. But things do go wrong from time to time. In fact, one 2016 study, published in BMJ, found medical error is the third leading cause of death in the U.S. There is some good news in all this. If you or someone you love is a victim of medical error or medical malpractice, you can take legal action. Medical malpractice occurs when a medical professional does not provide medical treatment that lives up to the established standard of care. The injury that results must have been caused by the medical professional’s negligence, and must result in significant damages to the individual. Significant damages can include loss of income, disability, high medical bills or pain and suffering. In 2016, across the state of Pennsylvania, there were 1,541 medical malpractice filings. Those filings resulted in 110 verdicts, which ranged in value from less than $500,000 to, in rare cases, more than $10 million — Pennsylvania is one of a few states that does not have an upper limit on medical malpractice damages. If you believe you are a victim of medical malpractice, you might need to decide whether to settle a case out of court or take the case to court and have a jury decide the verdict. There is no one “correct” answer when it comes to choosing whether to settle a medical malpractice lawsuit or go all the way through a trial. The answer depends on several different factors. When you settle a medical malpractice case, your team and the medical professional’s team agree on the amount of damages and the result of a case, before the case has gone all the way through a trial. It is also possible to settle a medical malpractice case right at the bitter end, just before the jury returns its verdict. 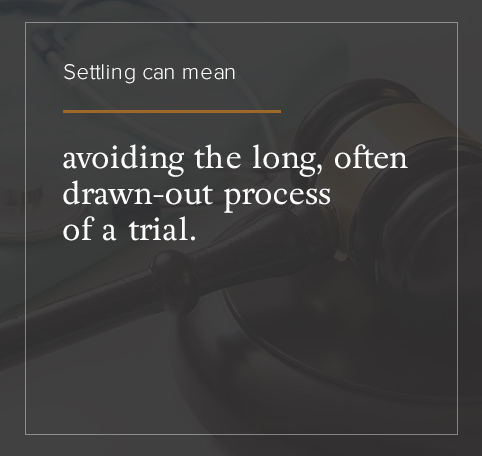 Settling can have advantages and disadvantages for both the plaintiff — the patient or members of the patient’s family — and the defense — the doctor or the medical professional. For the plaintiff, settling can mean accepting less money but receiving the payout sooner rather than later. It can also mean receiving any money at all, rather than putting your fate in the hands of a jury. For both parties, settling can mean avoiding the long, often drawn-out process of a trial. During a medical malpractice case, the goal is to prove the actions of the medical professional deviated from the standard of care, leading to your injuries and damages. The more evidence you have to prove that to be true, the more likely you are to receive some amount of damages. In fact, it is worth pointing out that in Pennsylvania, medical negligence claims often cannot go forward without something called a certificate of merit. The certificate of merit is a signed statement from another medical professional stating there is “reasonable probability” the actions or lack of action by the other medical professional played a part in causing you harm and fell outside the standard of care. Without the certificate of merit, a case cannot proceed. But even with the certificate of merit, the case can still be weak. A review of the outcomes of medical malpractice cases over a 20-year period found medical providers won up to 90 percent of cases with weak evidence of doctor or hospital negligence. If you do not have a considerable amount of evidence to demonstrate a decision made by or an action performed by your medical provider led to the injury, it might be in your best interests to settle, rather than move through a trial. You might be new to the process of finding an attorney for a medical malpractice case, but the insurance companies and defense lawyers who work with medical professionals are not. Often, defense lawyers have records and lists of a medical malpractice attorney’s cases, verdicts and settlements. If the attorney you are working with has a reputation for accepting lowball settlements, you might not get the best settlement offer. Another thing to consider is your attorney’s experience level. Going to trial can be intimidating for inexperienced lawyers, which means they might prefer to have you settle and might encourage you to accept an offer that is too low. Meeting with an attorney and reviewing their experience and track record before you agree to work with them is always a good idea. In many ways, deciding to go to trial with a case is like rolling the dice. Some people can stomach the risk involved. Others get very nervous. If you know you can’t tolerate risk, it might be better to settle a case than to endure the stress of a trial. But if you can handle some risk, and your attorney thinks you have a good shot at winning the case, going to trial might be the better option. Medical negligence cases can take much longer than you might expect. One study found there was an average of five years between the initial injury and the close of a medical malpractice case. If your injuries or disability keep you from working or otherwise affect your income and financial situation, five years can be a very long time to wait. Since every person has a different financial situation, the lengthy trial process is not necessarily a reason to settle automatically. If you need the money as soon as possible and do not have other options, such as lawsuit funding or assistance from family or friends, settling — and potentially taking a smaller payout — can be your best choice. But if you believe you can stretch your finances for the length of the trial and you will get a better result if you wait, not accepting a settlement can be the way to go. Although a trial by jury should involve the jury examining the facts and making a decision based on that, that is not always what happens. One study found that jurors often give doctors the benefit of the doubt. Juries rule in favor of medical professionals in 50 percent of cases when the evidence of medical negligence is strong. In some ways, the behavior of the doctor or medical professional can sway the jury. A doctor who seems charming and friendly on the witness stand is usually more likely to have a jury on their side, even if the proof is against them. People want to trust medical professionals. If the person you are going to court against has a trustworthy demeanor and can convince most people to see their side of things, you might be better off trying to negotiate and settle your case. Does the Doctor Want to Settle? Whether the doctor wants to settle will not affect your decision to settle a case, but it can affect your ability to settle at all. Whether a medical professional or the medical malpractice insurance company has the final say when it comes to settling depends on the contract between the two. In some cases, the medical malpractice insurance company can decide to settle, even if the doctor does not want to, if settling is in the doctor’s best interest. There are also instances when a doctor can overrule the decision of the insurance company, but does so at personal financial risk. In those cases, the doctor might be responsible for paying the difference between the potential settlement amount and the amount of the verdict. Why would a doctor not want to settle? They might decide going to trial is a better risk to take than having a record appear under their name in the National Practitioner Data Bank, which ensures disclosure of damaging performance. Although the data bank isn’t open to the public, doctors typically want to avoid having a dark spot on their records. Although the vast majority of medical malpractice cases do end up settling out of court, there are times when going through the trial and waiting for a jury’s verdict makes more sense. For example, the potential to receive two to three times the settlement amount if you wait for a jury’s verdict can make going through the lengthy process of a trial worth it. When deciding whether to continue to sue or to accept a settlement, here’s what to consider. In some ways, bringing a case to trial is like investing in the stock market. You can’t expect past results to be repeated in the future. But you can look at previous results as a way to gauge the risk of going to trial and whether you stand a chance of winning if you decide to have a jury come to a verdict. For example, some medical malpractice cases stir up sympathy in jurors, which may make them more likely to bring back a big win for the plaintiff. You may also live and be suing in an area that has a history of returning large verdicts for the plaintiff. While that history does not guarantee you will see a better outcome if you wait for a jury verdict rather than settle, it does tip the odds slightly in your favor. Your current financial situation might also influence whether you end up going all the way through a trial or not. If you are barely making ends meet each month, or are not making ends meet, you might feel compelled to settle to get the money sooner, rather than later. But there are also instances when a medical malpractice lawsuit has a limited impact on your current financial situation. If the injury happened to someone in your family who does not bring in income, such as a child, and your insurance covers most of the medical bills, it can be worth going to trial and waiting for a verdict. The verdict amount might be considerable, enough to support the child as they grow up, while a settlement amount might only provide enough for a few years. In some cases, the defense might feel it is likely to win if the case goes to trial. In light of that, it will offer a small settlement amount, one that is nowhere near the amount of damages you are seeking. If that happens, you might find going to trial is the best option, especially if your attorney thinks you have a strong case. In some instances, a defense team might initially make a lowball offer, then increase the amount later on. In either instance, not accepting the first offer is usually a good option. As mentioned above, jurors often give medical professionals the benefit of the doubt. They want to believe doctors and trust them. But a particularly moving plaintiff can also sway a jury. If your case is likely to arouse a lot of sympathies — for example, if you are a parent grieving the loss of a child or a parent with an injured child — going through the trial process might work in your favor. The same might be true if you are a particularly likable person. Some people just exude friendliness and can convince juries they are trustworthy. If that is the case, it is more likely the jury will be on your side and more likely to decide in your favor. If you are working with an attorney who does not often go to trial or who frequently loses court cases, settling might be a good choice. It might also be a good choice to find a better attorney. But if you are working with a trial attorney who has a solid track record of winning — and even better, not only winning, but getting high-value jury awards — going to trial might be the better pick. When you have a medical malpractice case, there is no guarantee things will work in your favor. But knowing your odds can help you make the decision most likely to give you the desired outcome. If you or a member of your family has been the victim of medical malpractice, speaking with an experienced attorney can help you better understand your options and the pros and cons of your decision. To learn more about settling or taking a case all the way through trial, contact KBG Injury Law for a free consultation today.